The familiarity people develop with your brand has, and always will be, incredibly important. Whether it’s an association with your name, logo, services, or characteristics, making people aware of your existence is half the battle when it comes to increasing sales or business. Creating brand awareness campaigns can be a bit of a minefield these days. To make the biggest bang, you need to think about all forms of exposure; digital and traditional marketing, earned and owned PR, collaborations and good old fashioned face-to-face contact, to name a few. It’s not easy to tick all the boxes, but in order to produce a well-rounded campaign, it pays to develop a concept that can be easily translated and maximised across all mediums. As a fairly new business, we recently ran a local campaign to help with brand exposure and expanding our social media presence. While it didn’t ‘go viral’, as the young ones say, as a local Taranaki business we were pretty happy with how it did go. We thought we’d share a few points we kept front of mind when creating the campaign, along with a couple of things we learnt along the way. 1. Develop a unique idea > This is easier said than done, but coming up with something that’s a little bit quirky is key to obtaining any sort of cut through with traditional or online media. Our take > We wanted to run a social media campaign that aligned with our brand, and the brand of the New Zealand Tattoo & Art Festival (of whom we were the design partner). There were a number of “free tattoo” competitions going up on social media at the same time, so there was a need to differentiate from those. Getting a tattoo requires an element of bravery, but not necessarily for the NZTAF market. We knew we had to take it next level and make the stakes a little higher. And so, Tattoo Roulette was born. 2. Create a strong brand, name and/or graphic > This needs to be catchy and easily recognisable to your audience as you continue to build the narrative around your campaign. A catchy name is great for talkability and word-of-mouth PR, particularly when paired with a unique concept. Our take > The concept of tattoo roulette was nothing new, however, we made it unique to us by creating specific branding that was used across all online graphics and activation collateral. 3. Consider your time and resources > Maximum exposure – low cost and time commitment. I’d say that pretty much sums up anyone’s goal when running a campaign or activation. It’s important to make your campaign as fun and interesting as possible – mainly to keep yourself entertained – then any extra time you’re giving doesn’t seem so bad. Our take >We knew we needed something that would pretty much run itself. A social media competition is a great way to achieve this. Outline the Ts & Cs, put up your post, let it run, pick a winner. We sorted a time that would suit all parties to spin the wheel and complete the tattoos. This meant we only had to be in “work mode” for a short time. Thanks to NZTAF organisers, our giant wheel was placed in the foyer of the festival over the weekend, meaning we were able to gain maximum brand exposure without having to man it the whole time. While we did have to wait for the tattoos to be complete, that whole process was extremely entertaining, meaning our time was well spent. 4. Align with key partners > Building relationships or utilising established ones can be a huge bonus when conducting a brand awareness exercise. Whether it’s collaborating at an event or helping each other out on social media, you are guaranteed to get more eyes on your brand if someone else is helping to push your campaign. Our take > We were incredibly fortunate and grateful to have the backing of Brent Taylor at the NZTAF. Brent reposted our competition on his Facebook and Instagram channels, and the effect was immediate. Without his help, we wouldn’t have generated half the reach we did on social media. He also helped us refine the original concept and align with the tattoo artists at Ink & Anchor. Our branding was also placed in key locations at the festival. What a legend! We owe him big time! 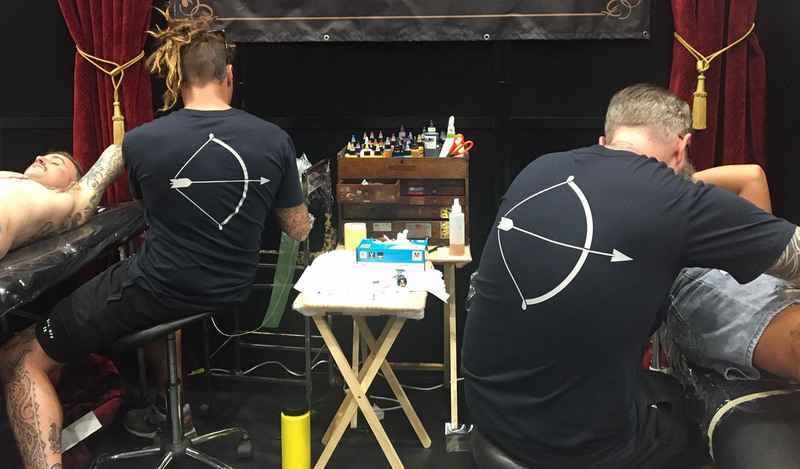 We also printed branded T-shirts for the guys at Ink & Anchor to wear while tattooing. We knew these details would be captured in any photos/video taken on the day, therefore, another important brand exposure opportunity. 5. Use identities where possible > While many people are dubious about the idea of social influencers (including myself), there’s no denying the fact that a little bit of celebrity status can work in your favour. Aligning with businesses or people can be extremely good for your reach. Our take > Again, thanks to Brent and his relationship with Electric Ink Skincare, we heard that Gareth Noble, who recently featured on Married at First Sight, was keen to play Tattoo Roulette. We initially didn’t think we’d be able to get two tattoos done, but once a few logistics were sorted, we were stoked to have Gareth on board. Not only did he go on to be an awesome part of the competition, but he kindly posted about the event prior and during and after, as did Electric Ink, enhancing our reach once again. 6. Treat your people well > This is often a genuine trait that happens organically, but sometimes it can be missed. If you’re engaging competition winners, or collaborating with businesses, think about their needs and make sure they enjoy the experience. By default, they will become your brand ambassadors, and if they have a good time, this will help to create a positive association with your brand. Human nature is to talk about our experiences, so this positivity will then have a flow-on effect to their friends, family, colleagues and anyone in between. Our take > We were lucky to be blessed with two awesome competition winners. We invited them to the NZTAF opening, and provided them with t-shirts and VIP passes to ensure they could make the most of the weekend. We also liaised with them closely throughout the activation to make sure they were comfortable with how things were panning out. 7. Be bold > Being brave with your concept can work in your favour, or, it can not. It’s often a risk, but as long as you’ve thought about the possible PR repercussions, go for it. It’ll get you the story, it will get the people talking, and it will get you the exposure you’re looking for. Our take > We knew there were some dubious tattoos on the roulette wheel – some that would be frowned upon by the general public, and a couple we certainly wouldn’t want to get ourselves. As it turns out, Gareth ended up with the most riskay of the lot – male genitalia, in a bow. This ended up in the local paper, and while we were a little bit unsure about aligning our brand with such objects, it really did sum up the whole competition we were running. It also generated A LOT of conversation. As it turns out, Gareth was stoked with his tattoo and so was our other competitor, Sarah, who ended up with a pimped up version of the poo emoji. Their happiness was our main concern. We couldn’t have asked for two better sports! 8. Reach out to media > Let the media know what’s happening. Do your research first, and when you’re designing your concept, make sure it has a drawcard for them. Think about photo and video opportunities that would work well for them and their online channels. Our take > We knew we had a risky concept, that would be great for photo and video. We also had a TV personality. All key elements to consider. With the NZTAF being a major event in New Plymouth, we knew local media would be attending. We simply let them know something a bit different was happening, with the hope we’d get a mention in a wrap-up story of day one. We were lucky enough to be the lead of that story. 9. Capture the moment > Capture your own video and photos where possible. This can then be used post event, to show your online audience, and those who may have missed the event, how it went. This is another key avenue to further your awareness and get the most out of your campaign. 10. Analyse and learn > Document your reach and engagement, where possible, and track how each stage of your campaign or activation is going. Jot down things along the way that may not have gone to plan, or things that could have been done better. This will help you make your campaigns bigger and better each time. Our take > We would love FTB Tattoo Roulette to become an annual part of the NZTAF. During the event, we talked to our players, tattoo artists, and people watching. After the event, we made a list of all the things that would be great to introduce or change, next year. When next year rolls around, we’ll get that list out and look at what we can implement to make the activation even better. 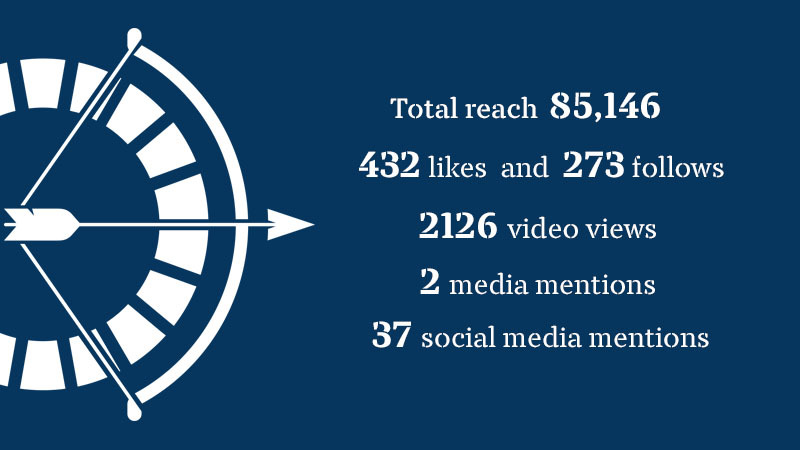 *Statistics were taken from organic posts on FTB social pages, along with two of NZTF’s posts. Stats do not include any other third party posts.